WP Resort will be open through May 12th!!! ***Check out our Reduced / extremely LOW rates for late ski season! Ask about best deals for lift tickets and ski rentals too! Beautifully decorated, this 2 bedroom, 1.25 1st Floor condo sits on the Fraser River. We provide our guests with all the comforts of home (upgraded linens and towels, hair dryers, paper goods, soap and lotion), plus complimentary coffee, tea, hot chocolate and condiments. New ceiling, lights, refrigerator, dishwasher, microwave and cabinets in kitchen. Dec 2018: New carpet in bedrooms, family room and hall. 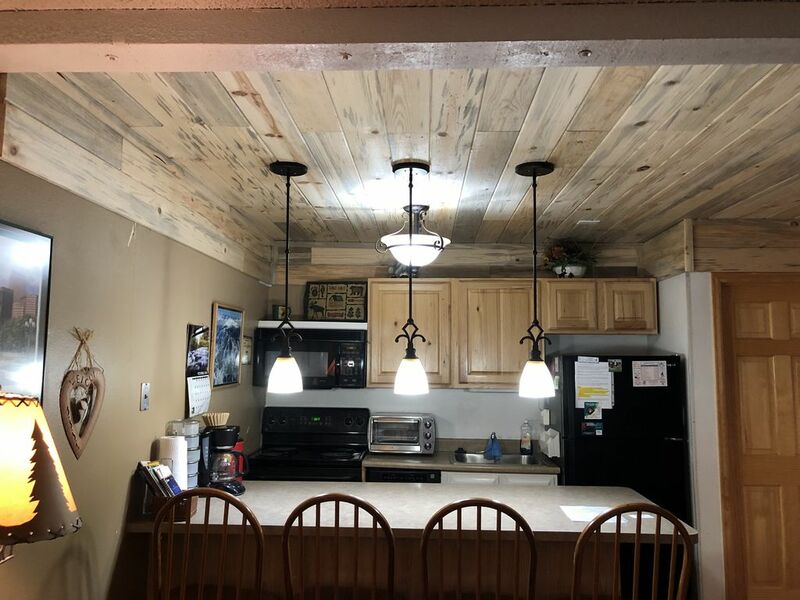 This condo comfortably sleeps up to seven people: master bedroom with queen lodge pole bed, private vanity (1/4 bath) and stackable washer/dryer for small loads. Second bedroom with twin lodge pole beds and an extra twin mattress. There is a leather sectional recliner/sleeper sofa in the living room. Shower and toilet (3/4 bath) are separate from hall sink / vanity (1/4 bath). Nestled in the pines, overlooking the river with fantastic views of the mountains, this condo is a mere 2 to 5 minute walk to a variety of restaurants and shopping. Our condo is equiped with a DVD player/VCR player and lots of movies, and three cable TV's plus WIFI. We also have cards, games, and books available for use during your stay. Full Kitchen-all utensils, including crock pot and pampered chef stones. Wood Fireplace and large TV in living room. FREE SKI SHUTTLE BUS picks you up right outside building - JUST 2 QUICK MILES to be dropped off RIGHT BY THE SKI LIFTS! The Recreation/Health Club includes indoor pool, 3 hot tubs, game room (pool table, air hockey, video games, cable TV), locker room, showers, (pool towels for $1 fee) and coin-op laundry facilities. * Entirely Brand new Rec Center opened in 2016! Seasonal activities include skiing, hiking, biking, snowmobiling, sledding/tubing, fishing, hunting, boating, and golf. Many hiking and biking trails begin right outside condo area. (No smoking, No Marijuana, and No Drug Use in condo). * Rates listed below are 25% to 50% BELOW the best discounted rates advertised for similar condos in Winter Park. * Call or e-mail ASAP to reserve. * In Order to reserve, your Deposit of 50% by Check is Required. * Check availability at Rental Calendar below, but call for latest update. * Full amount will be required if reserving within 15 days of your intended stay. * Many nights ARE STILL AVAILABLE for fall and the upcoming ski season! Pet Fee and Damage Deposit will be refunded after cleaning and confirmation of no damage. Each of these deposits are $150. VRBO adds them to the quotes. Please contact us for an exact rate based on your length of stay. If interested in renting additional units for more than one group, or if this one is booked for your desired dates, we may be able to help you find another unit, please ask for details. My brother and I own this condo with our spouses to help our kids have more fun in the snow on the weekends & over breaks. We enjoy using it for family time when it is not rented out. It is our getaway in the ski town in the mountains. We enjoy skiing in Winter Park as a family, and my sister and brother in law own a 3 bedroom condo in Hi Country Haus. We would come up on the weekends and stay at their place. Our dream was to own one of our own someday. My goal was to wait until our youngest was done with daycare. Needless to say we started looking right away and found the condo of our dreams. We purchased it with my brother & his family from Cincinnati. I manage the property and he comes out at least once a year to enjoy it with his family/friends. It has been a great investment and we are thankful VRBO has referred us so many wonderful renters. We enjoy the hot tubs. We cruise up on Friday nights so we can relax in the hot tubs at the rec center. We also enjoy them each day after we ski. Most of all I enjoy the fact that I don't have to clean them or maintain them. We enjoy the coziness of the condo yet the kids have the retreat of going in the bedroom and watching their own TV shows. I enjoy the beauty of the condo being on the first floor with a view of the Fraser River. Nice to hear when the windows are open. 1.25 Toilet and Tub/Shower in Bathroom. Two separate vanity sinks and mirrors - one in Hall outside Bathroom and one in Master Bedroom. One block from Main Street downtown. Great location to walk around Winter Park. Feel free to bring wood for fireplace! Help yourself to anything in the pantry including spices and cereals. Just a breakfast nook with 4 barstools. 2 Flat Screens and one 32 inch. Winter Park Resort bus service 5 miles, 10 minutes every half hour. Two indoor & one out door on the deck at the rec center. Mom and I and the dogs were quite comfortable. A great place to stay. Everything you need and nothing you don’t. Was only sad about having to leave a day early because of the impending blizzard. We had a great time. Diana was amazing. We could not have asked for anything more. The condo was cozy and just enough space for our family of 6. Great location close to everything we did and we loved how close the rec center was as well... what a good way to wind down at the end of the day. Thank you sooo much Diana!! Liz & family glad you enjoyed the condo and hope you come back! We love this property and love Hi Country Haus! Everything you need in a cozy home that makes you feel welcome. A quick walk to town, the pool, or a shuttle ride to Winter Park. We will be staying here again. Thanks for sharing your condo with us. Great location for a cozy condo. It had everything we needed and wanted. Great value for the price. When a carpet contractor missed an installation appointment, the unit was not ready for us to stay. Diana lined up another unit for us immediately. We had a wonderful stay, with Diana making sure our stay was not affected by the issue. That is true customer service!